In this page I'll show you an intuitive way of understanding the derivatives of trigonometric functions. We'll deduce the derivatives of the functions sin(x) and cos(x) using an intuitive graphical method. Having the formulas for the derivatives of these functions, the calculation of the derivatives of all other trigonometric functions is just an application of the chain rule and product rule, which you can learn later. 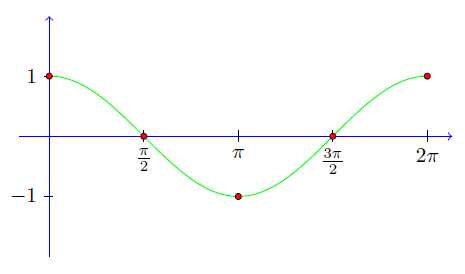 The most important part of learning how to deal with trigonometric functions in calculus is internalizing the graphs of the functions sin(x) and cos(x). Let's construct the graphs of these functions, step by step. This is a simple construction that you'll be able to do in your mind every time you need to recall the graphs. 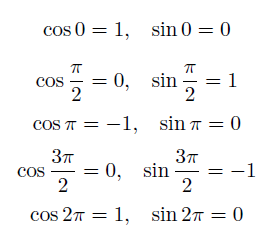 From the definition of the trigonometric functions sin(x) and cos(x), the coordinates of the point of intersection of the triangle and the unit circle are the trigonometric functions, as shown in the picture. This means that we can deduce any value for sin(x) and cos(x) from the circle. First choose an angle x and consider the ray with angle x. 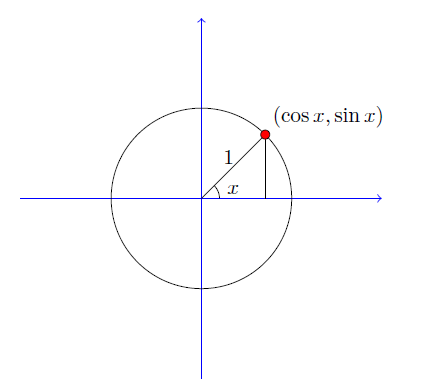 Then, the intersection of that ray with the unit circle will have coordinates (cos(x),sin(x)). 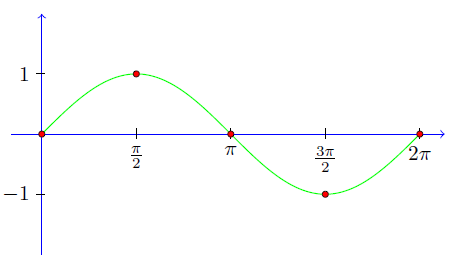 These two graphs are very important in calculus. It is very useful to remember them, or to know how to construct them. Remember, to construct them you only need to know the values of sin(x) and cos(x) at the special angles. Now that we know the graphs of sin(x) and cos(x), we can calculate the derivatives of these functions. We will use an intuitive graphical approach. 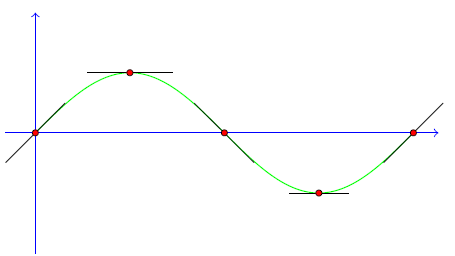 Specifically, we will use the geometric definition of the derivative: the derivative of sin(x) at point x equals the slope of the tangent line to the graph at point x. We need to calculate the slopes of these lines. The horizontal lines have zero slope. If we actually measure the slope of the first line to the left, we'll get that it has slope 1, because the angle it makes with the x axis is of 45 degrees. The derivative of sin(x) equals cos(x). To remember this fact, just draw the graph of sin(x) (in paper or in your imagination) and the tangent lines at the special angles. 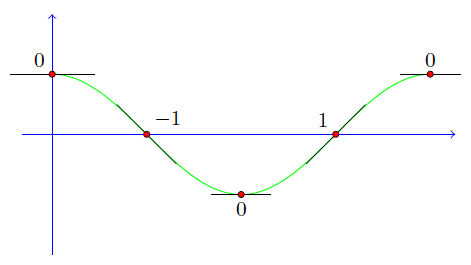 You'll remember that slopes of the lines and that they coincide with the values of cos(x). The slope of the first line equals zero, because it is horizontal. 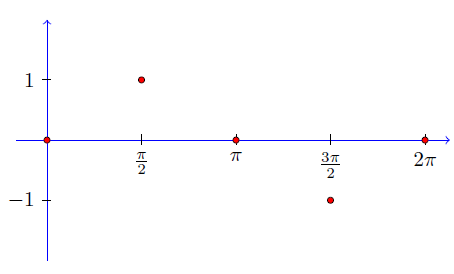 The second line has slope -1, because it has the same inclination as the third in the graph of sin(x). The third is also zero, because it is horizontal. 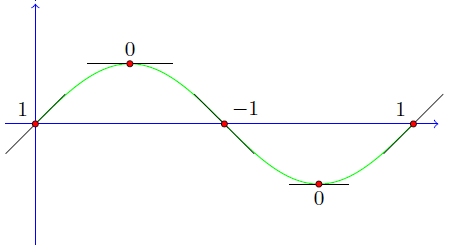 The fourth has slope 1 and the last zero. Now that you learned these two derivatives, your next step should be to learn about the chain rule. So, go there now. If you already have mastery of BOTH the chain rule and product rule, you can read on the examples below. Now that we know the derivatives of sin(x) and cos(x), we can use them, together with the chain rule and product rule, to calculate the derivative of any trigonometric function. Just to illustrate this fact, I'll show you two examples. If you haven't yet learned the product rule and chain rule, you can skip these. To see more examples of derivatives, spend some time in the solving derivatives page. There you'll find more complicated problems related to what we have learned so far.